Relief from tension and pain. Research on the impact of yoga for specific conditions continues to expand. Several key studies have demonstrated that specialized and targeted Viniyoga™ interventions can impact low back pain, pain, stress, sleep, depression, and respiratory function; all health concerns that impact employee populations. Yoga and other wellness services can be an important part of keeping your employees healthy. 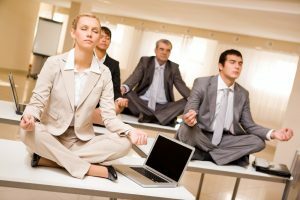 If you refer your employees, you want to be able to trust that the yoga will be appropriate and individualized for the employee. The majority of teachers in our studio are trained in Viniyoga™, a lineage of yoga known for the breath-centered physical practice, safe sequencing, adaptation and individualization of the practice for the individual. Viniyoga is a comprehensive approach to yoga that incorporates asana (physical postures), pranayama (breathing practices), meditation, and sound as appropriate for the condition or the individual. 5 Koshas offers a variety of general yoga wellness classes to keep your employees healthy and Therapeutic Yoga classes for common issues seen in employee populations such as low back pain, hip and knee issues, upper back neck and shoulder issues, chronic stress, anxiety, and sleep issues. We also offer a specialized program using yoga for habit change, including changing habits around diet, exercise, sleep, money management, use of electronics and other habits that impact health. Contact Jay at jay@5koshasyoga.com about corporate options. $60/person for 6 weeks – Minimum of 7 participants. *Discounts may apply for some groups such as educators, minimum # for a 6 week series would be 10 participants. *Participants can attend an in-studio class if they miss an on-site class. Call to discuss your interests and needs.